The Poetry Translation Centre is seeking up to three new members for our Board of Trustees. We are particularly keen to hear from candidates with experience in digital marketing, publishing, HR and/or fundraising. 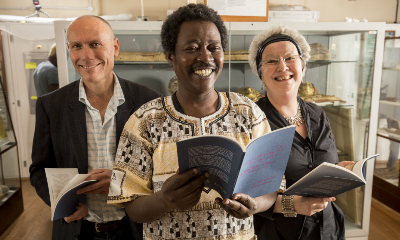 The Poetry Translation Centre was established by the poet Sarah Maguire in 2004 to introduce new audiences to leading poets from around the world, as well as better understand and celebrate the diverse communities who have made their home in the UK. We focus on poetry from Africa, Asia and Latin America, working collaboratively with poets and translators to bring new work to English-speaking audiences in the UK. In our first 12 years we have grown into an organisation with global reach and a reputation for literary excellence. We have translated over 400 poems by 115 poets; published 18 bilingual chapbooks, three full-length collections and one award-winning major anthology; worked with 75 translators and poet-translators; and developed prestigious event and publication partnerships. As we approach our 15th anniversary in 2019 we aim to raise the ambitions of our artistic programme as well as strengthen our organisational capacity and resilience. As part of this next chapter we seek to expand our Board of Trustees. Our Board is instrumental in the strategic planning of the PTC and overseeing our overall artistic vision. The Board provides the PTC team with guidance and support, and is responsible for ensuring that the organisation’s assets are safeguarded by providing strong governance in the areas of finance and management. Our Trustees are also active champions of the PTC and help to fundraise for the organisation. The Board, chaired by literature professional Allison DeFrees, meets four times per year at our London office. Trustees serve for a three-year term, which may be renewed once. Please submit a CV, with names and contact details of two referees, and a letter of not more than 500 words explaining why you are interested in joining the PTC’s Board of Trustees and what you would bring to the Board. Interviews for shortlisted candidates are planned to take place in the week of 16 May 2017. We look forward to receiving your application. If you have questions, please write to PTC Chair Allison DeFrees at allison@cwagency.co.uk.